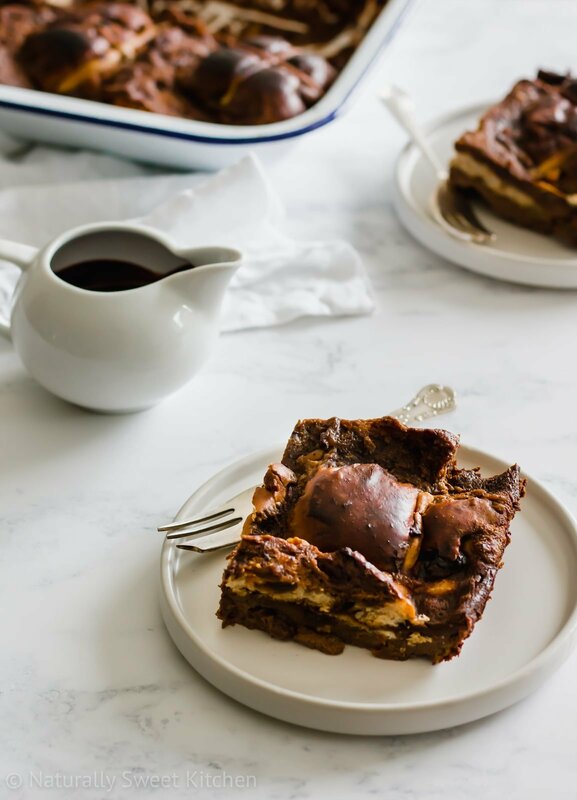 This rich and decadent chocolate hot cross bun pudding is the best way to use up leftover hot cross buns. 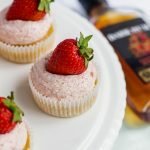 Pairs beautifully with refined sugar free vanilla ice cream or naughty double cream. I can see your face right now. You’re looking at the title of this post and thinking, “she can’t be serious – those two things just don’t go together.” That’s where you’d be wrong, my friend. This recipe is pure Easter pudding gold. I know it seems a little outside-the-box, but hang in there with me while I explain the genius of this Chocolate Hot Cross Bun Pudding. If you’ve tried my easy hot cross buns recipe (and if you haven’t, you definitely should before Easter! ), you know the main flavours in them are cinnamon, nutmeg, all-spice, raisins, and orange. Now take each of those flavours and pair them with chocolate. Cinnamon and chocolate? 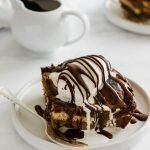 Who doesn’t love a chocolate chip cinnamon coffee cake? 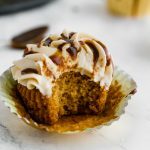 Nutmeg and all-spice? I give you pumpkin chocolate chip cookies. And I don’t even need to mention chocolate-covered raisins or Terry’s Chocolate Oranges, do I? #Nuffsaid. “But all together in one pudding?” I hear you cry. Yes, friend, 1000x yes. This Chocolate Hot Cross Bun Pudding recipe actually came to fruition not because I had leftover buns (because, honestly, who ever has leftover hot cross buns? ), but because I had a very vivid recollection of a bread and butter pudding that my grandma used to make. It was a simple dessert – just leftover buttered crusty bread mixed with egg, cream, cinnamon, and raisins and baked until crisp and golden on top. We’d each ladle out a bowl straight from the oven and top it with a generous (more so in my grandma’s case) scoop of vanilla ice cream. I remember climbing into her squishy recliner chair and letting the ice cream melt until it created a little moat around the pudding. As I dug into the dessert, she’d remind me to blow on it just before a too-large spoonful of the hot bread pudding hit my mouth. She used to serve it to us around Easter every year, which leads me to believe that bread and butter pudding is an Easter staple. Is it the same in your family? I may have jazzed my grandma’s bread pudding up a little by using hot cross buns and adding chocolate, but the tradition and love behind the dessert stands strong. I don’t think she would have minded. Make sure the hot cross buns you’re using are as stale as possible. This will help soak up more of the custard and infuse the bread with all the chocolatey flavour! Also the wetter the buns are, the less likely the pudding is to burn. Don’t boil the cream mixture when you’re heating it or it may curdle. Only bring the mixture to a scalding point. You’ll be able to tell it’s reached this point by the tiny bubbles forming at the side of the pot. When you’re adding the cream mixture to the eggs, make sure you pour very slowly and whisk at a good clip. If you dump all of the hot cream into the eggs at once, the eggs will cook and you’ll be left with chunky chocolate scrambled eggs. Tasty. Don’t skip the coffee! I know it sounds weird, but coffee actually enhances the flavour of chocolate. If you don’t like coffee, I promise you won’t taste it. Have a layer of aluminum foil on hand to throw over the pudding as it’s baking. 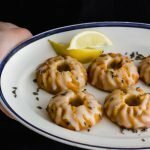 Each time I baked this recipe, it started to brown more than my liking around the 25-minute mark. The foil should keep the top from burning. This pudding is super rich, so it’s best served with a glug of cream or topped with some pooling vanilla ice cream! 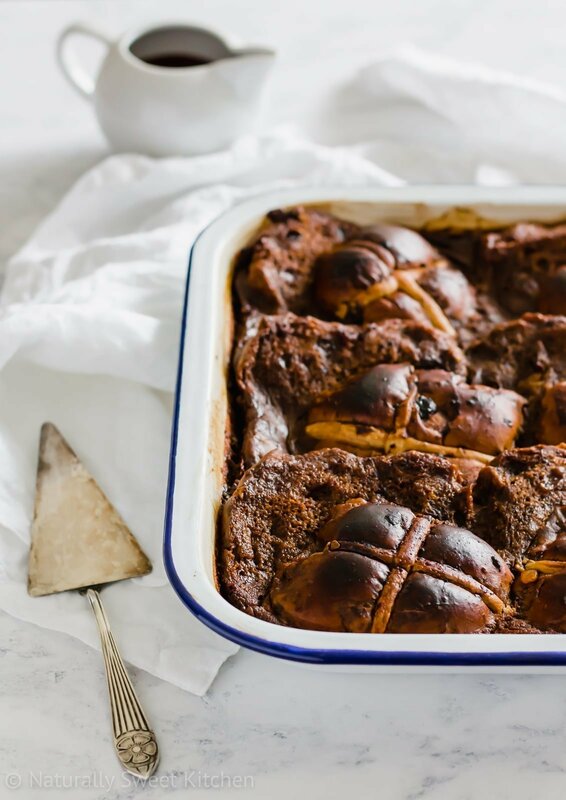 If you make this Chocolate Hot Cross Bun Pudding for your Easter dessert, please take a photo and tag me on Instagram and use the hashtag #naturallysweetkitchen. I love to see what you’re baking up. It makes my day! 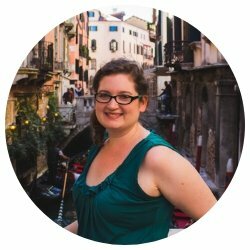 Also, keep an eye on your inbox tomorrow if you’re part of the NSK Crew, because I’ve got a special announcement coming that I’m SO EXCITED to share with you! If you’re not part of the Crew, be sure to get on the list so you don’t miss the news! 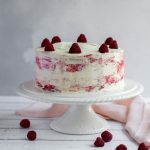 Looking for more refined sugar free Easter baking ideas? 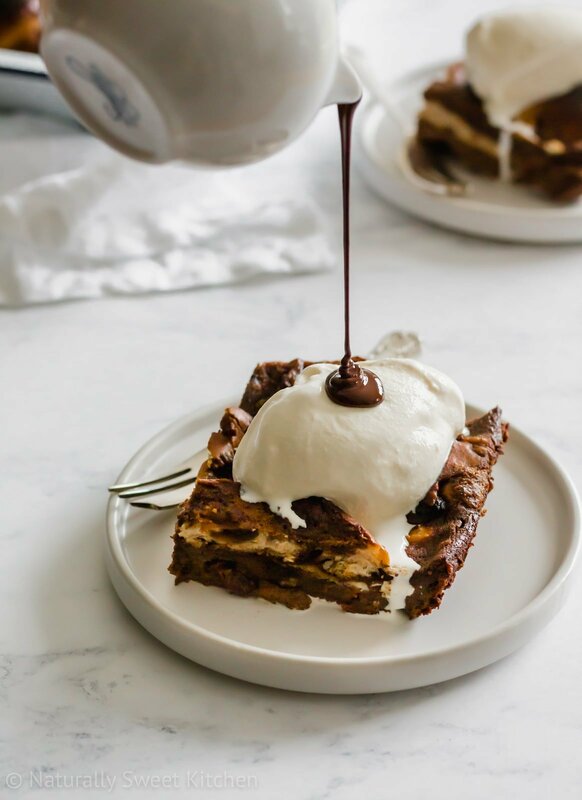 This rich and decadent chocolate hot cross bun pudding is the best way to use up leftover hot cross buns. Slice the hot cross buns in half and butter each half with an even amount of the butter. Arrange the halved buns in a lightly greased 11 x 9 inch (28 x 23 cm) baking tray so they slightly overlap. Set aside. In a large bowl, whisk together the eggs, vanilla paste, coconut sugar, and cacao powder until combined. Set aside. Place a saucepan over medium-low heat and gently warm the double cream, milk, and coffee. Stir frequently so that the milk and cream do not burn. Once the liquid reaches a scalding point (little bubbles should form around the edge of the pan), remove it from the heat. Pouring very slowly, whisk the hot liquid into the egg mixture. It’s important to pour slowly and whisk quickly so that the liquid doesn’t scramble the egg. Carefully pour the combined mixture over the prepared hot cross buns. Using your hands, press the buns into the liquid to cover. Allow the buns to sit and soak up the liquid for 15 minutes. Meanwhile, preheat the oven to 170ºC (325ºF). Once the buns have sat, bake the pudding for 50-60 minutes. Keep a layer of foil on hand to throw over the top at the 25-minute mark should it begin to brown too quickly. 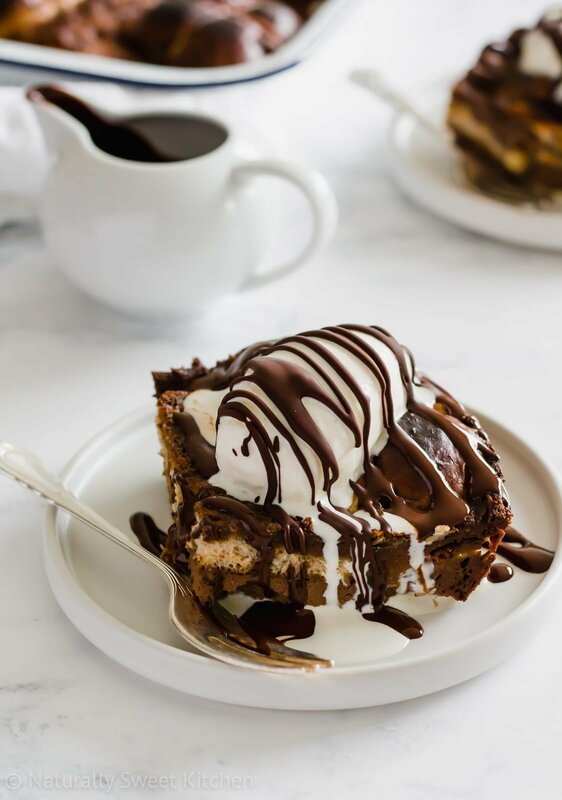 Remove the pudding from the oven and allow to cool in the pan for 10 minutes before serving warm with vanilla ice cream or cream and melted chocolate. This pudding is best consumed the day it is made. If you cannot finish it, you can slice it into serving size pieces, wrap in foil, and freeze in an airtight container for up to 3 months. To reheat, remove a piece from the freezer 8 hours before and allow it to defrost in the fridge. Bake at 170º (325º) in the foil packet for 12-15 minutes.